This week, retired Admiral William McRaven published an unsparing open letter to President Trump in The Washington Post requesting that, in the wake of the president’s decision to strip former CIA Director John Brennan of a security clearance, the president grant him the same honor. It is a startling intervention by a luminary of military leadership—the man responsible for the raid that killed Osama Bin Laden—who has not previously publicly criticized this president, nor any other for that matter. To understand the meaning of McRaven’s intervention, one must recognize the ongoing challenge faced by former national security officials and military officers regarding appropriate responses to this president. National security is supposed to exist apart from politics—the identity of the president might change the list of national intelligence priorities or military objectives, but the job stays the same. This is a realm in which everyone is supposed to be on the same team; permitting cracks in that foundation leads to rapid erosion. Even after retirement, former military officers and similarly situated national security officials typically refrain from overt political participation: What is a formal rule during the period of service transforms into a powerful norm of silence upon return to civilian life. The candidacy and presidency of Donald Trump has upended this tradition. The president’s detractors are simultaneously applauding McRaven’s statement and lamenting that it will have no impact. They are correct that McRaven’s op-ed is unlikely to change any minds among the president’s base. It will not embolden congressional Republicans finally to take a stand. Certainly it will not shame Trump into ceasing his relentless campaign against any and all who would dare oppose him. But the letter isn’t designed to do any of those things. McRaven—a man so assiduously apolitical that he strenuously slapped down nascent rumors that he was being considered as potential vice presidential candidate—has now added his name to those who publicly oppose this president. In doing so, he is saying that the time has come for others in his circle to do the same. Indeed, the following morning, 12 former intelligence agency directors and deputy directors signed a public letter admonishing the president and urging that security clearance decisions remain apolitical. Former CIA Director and Secretary of Defense Robert Gates joined a day later. At least five of the signatories—including Gates, David Petraeus, and George Tenet—had not previously publicly criticized this administration. Until now, a great many other members of this small community have remained silent. They recognize that as the president assails the norms of apolitical national security, there is a risk that responding in kind only hastens institutional destruction. After all, what better way to prove the existence of a “deep state” working against the president than unified opposition of national security officials rising from the depths? It is against this backdrop that McRaven penned his missive. In speaking out, McRaven tells his peers that the cost of silence now outweighs the benefits of remaining above the fray. During the campaign, Adm. (Ret.) Martin Dempsey, the former Chairman of the Joint Chiefs of Staff, penned his own Washington Post open letter on retired military officers appearing at the Democratic and Republican conventions, writing that former officers “have an obligation to uphold our apolitical traditions. They have just made the task of their successors — who continue to serve in uniform and are accountable for our security — more complicated. It was a mistake for them to participate as they did. It was a mistake for our presidential candidates to ask them to do so.” Dueling letters signed by retired general and flag officers in support of Hillary Clinton and Trump likewise drew rebuke from scholars of civilian-military relations. Even Gen. Dempsey has moderated his prior critique that generals should remain apolitical, saying in March 2018, “I think the American people expect our military to be nonpartisan—not apolitical. We do have political beliefs, but we try to remain nonpartisan so that the American people never wonder whether we're serving one particular individual or one particular party or another.” Dempsey’s Twitter account now shares insights on leadership that are on the surface unrelated to politics, but stand in such obvious contrast to the current commander-in-chief that they can only be described as subtweets. 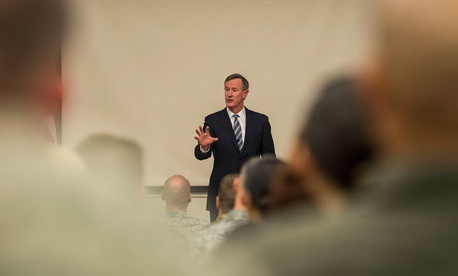 McRaven has been resolutely non-political throughout his nearly four decades of service and since returning to civilian life. And he is not attempting to be political now. For someone like McRaven to author this letter is to declare that criticizing this president isn’t about politics at all; it is a defense of the United States. McRaven’s risk is calculated, but it is still a risk. His prior reservations, those that compelled him to stay silent, may prove to be well-founded. Already, speculation is rising that McRaven plans to run for president in 2020 or that he should. McRaven may have been speaking to his compeers, but the rest of the world saw a man known for the stars on his shoulder, saying Trump is a danger to this country. He may have intended the letter to be a non-political act, but when it comes to commenting on this president there is simply no such thing. Nevertheless, McRaven has made his choice. He has added his name. Each person who follows his lead makes it easier for the next person to speak out—and harder for others to justify their silence.